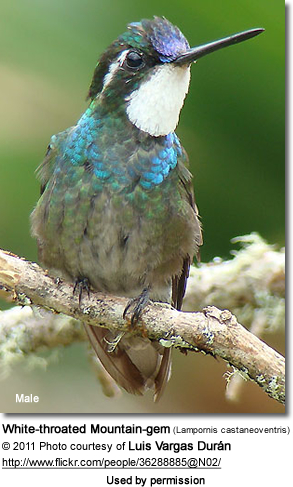 The White-throated Mountain-gem (Lampornis castaneoventris) is a Central American hummingbird that is found in the mountains of western Panama. In southern Costa Rica, it is s replaced by a distinct subspecies, the Grey-tailed Mountain-gem, L. cinereicauda, which is very close to becoming a distinct species (García-Moreno et al., 2006). 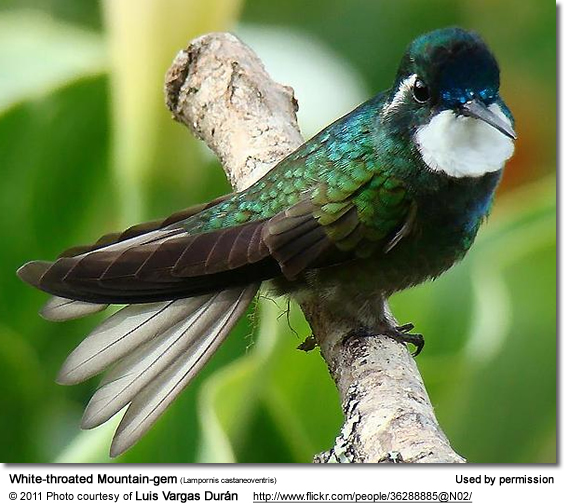 Another very close relative, the Purple-throated Mountain-gem, is found in the same geographic region. 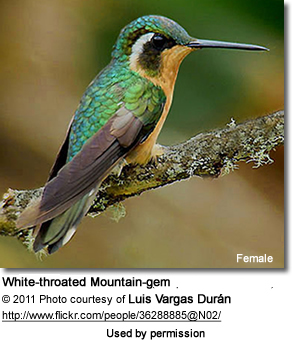 The White-throated Mountain-gem averages 10.5 cm or 4.1 inches long. Its shortish black bill is slightly curved. 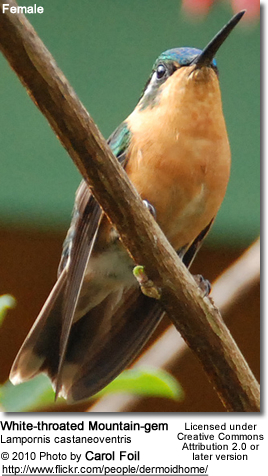 The adult male has bronze-green upper plumage. HIs under plumage also bronze-green except for thebrilliant green crown (top of his head), white throat and blue tail. The female has a rich cinnamon under plumage. She lacks the bright crown and throat of the male. Juveniles / young birds resemble females but have buff fringes to their upper plumage. The female White-throated Mountain-gem is responsible for building the cup-shaped nest out of plant fibers woven together and green moss on the outside for camouflage in a protected location in a shrub, bush or tree. She lines the nest with soft plant fibers, animal hair and feather down, and strengthens the structure with spider webbing and other sticky material, giving it an elastic quality to allow it to stretch to double its size as the chicks grow and need more room. The nest is typically found on a low, thin horizontal branch. The average clutch consists of two white eggs, which she incubates alone for about 15 to 19 days, while the male defends his territory and the flowers he feeds on. The young are born blind, immobile and without any down. 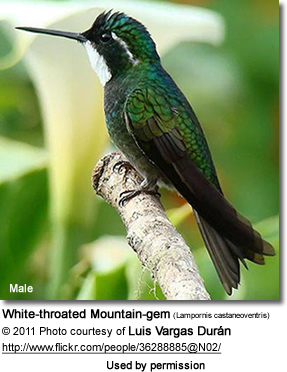 The White-throated Mountain-gems primarily feed on nectar taken from a variety of brightly colored, scented small flowers of trees, herbs, shrubs and epiphytes. They favor flowers with the highest sugar content (often red-colored and tubular-shaped) and seek out, and aggressively protect, those areas containing flowers with high energy nectar.They use their long, extendible, straw-like tongues to retrieve the nectar while hovering with their tails cocked upward as they are licking at the nectar up to 13 times per second. Sometimes they may be seen hanging on the flower while feeding. The food of this species is nectar, taken from a variety of small flowers, including epiphytic Ericaceae. 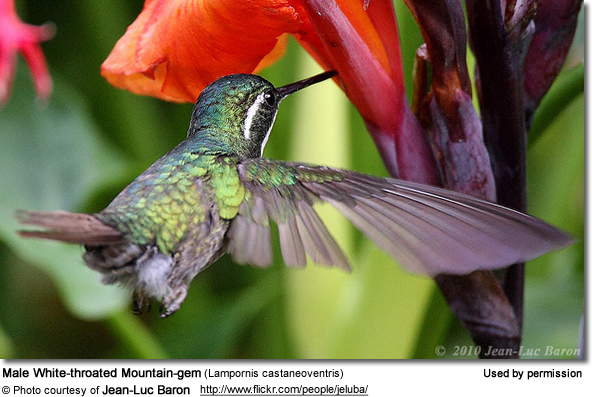 Like other hummingbirds it also takes small insects as an essential source of protein. 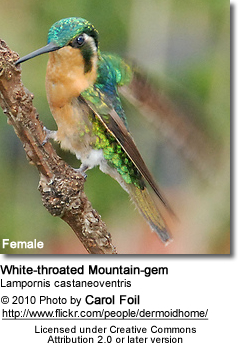 Male White-throated Mountain-gems defend flowers and scrubs in their feeding territories, and are dominant over most other hummingbirds.